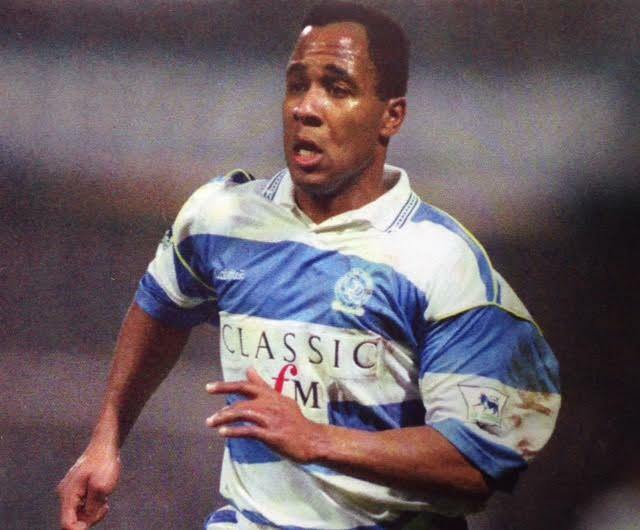 ‘Les Ferdinand knows what Queen’s Park Rangers should stand for. It should stand for stories like his. The local boy from Ladbroke Grove, who went to school just behind Loftus Road, is running the club that found him and made him. Ferdinand is Director of Football at QPR, trying to re-impose the values and the ethos that have been lost under the flood of money in recent years. Ferdinand knows Rangers shirts have been given out too willingly to players with no more ambition or hunger, whose careers have peaked and who just want to get paid. To the man who joined from Hayes for ¬£30,000, made himself a hero, then left for Newcastle United for ¬£6m, this is anathema, and not what this club meant to mean. ‚ÄúI grew up at this club,‚Äù remembers Ferdinand, 20 years on from when he played in hoops. At a time when boardrooms are further removed than ever from fan bases and communities, Ferdinand’s local feeling counts for something. So does the fact that, in an industry which unfairly distributes leadership roles, the director of football, manager and captain of QPR are all black. Not many English clubs give leadership roles to black men, but QPR do, with Chris Ramsey as a manager and Nedum Onuoha as captain. Ferdinand hopes this will change something. ‚ÄúIt is no coincidence I have been given the job by an Asian chairman (Tony Fernandes) rather than perhaps an Englishmen,‚Äù Ferdinand says. When it comes to players, Ferdinand knows what QPR fans want, and it is not Jose Bosingwa, Julio Cesar and the rest. Ferdinand is still, in essence, a football man. He gives this interview, at the training ground, in training gear. He watches the sessions – first team and academy – whenever he can and gives the impression he wishes he was still out there battering defenders and scoring goals. But Ferdinand is now a football man and doing non-football work, overseeing the transfer policy, assessing targets, negotiating with agents, clubs and all the rest. This has been another hectic QPR summer, with a looming financial fair play fine – likely to be lower than feared at ¬£8m – and the fiasco of Sandro’s invalid visa. Having completed a diploma in applied management at Warwick Business School, and the Football Association’s ‚ÄúOn Board‚Äù governance course at St George’s Park, Ferdinand feels equipped to confront these issues, knowing that his work is the necessary background to the main event. The most important task of any club is its recruitment, and this is the area which QPR have got so wrong recently. This summer they signed 14 players and lost 16 – they would have liked to get rid of more – trying to bring in only those who genuinely want to be there. The club have looked through the lower divisions and across Europe in pursuit of the right players with the right attitude. They signed Massimo Luongo from Swindon Town, Tjaronn Chery from Groningen and Grant Hall from Tottenham Hotspur, all of whom have started well. If the club has been too easily persuaded to part with its money before, that does not happen now. ‚ÄúAgents have been used to dealing with executives at this club, but they are now dealing with someone who knows something about football,‚Äù Ferdinand says. That team has started the season well – with three wins from five Championship games – although after last season’s relegation Ferdinand is clear that ‚Äúconsolidation‚Äù is the target this year, rather than a risky push for instant promotion. There is a new sense of calm at QPR, which is down to Ferdinand but also to Ramsey, whose coaching skills have endeared him to the players. ‘If I’d had Chris as a coach when I was a player coming through, I would have been better than I was,‚Äù Ferdinand enthuses.